In Tarahumara language, the term rarámuri refers specifically to the males, females are referred to as muki (individually) or igomele (collectively). Originally inhabitants of much of the state of Chihuahua, the Rarámuri retreated to the Copper Canyon in the Sierra Madre Occidental on the arrival of Spanish explorers in the sixteenth century. The area of the Sierra Madre Occidental which they now inhabit is often called the Sierra Tarahumara because of their presence. 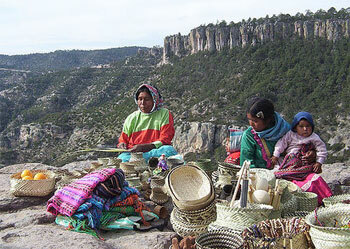 Current estimates put the population of the Rarámuri in 2006 at between 50,000 and 70,000 people. Most still practice a traditional lifestyle, inhabiting natural shelters such as caves or cliff overhangs, as well as small cabins of wood or stone. Staple crops are corn and beans; however, many of the Rarámuri still practice transhumance, raising cattle, sheep, and goats. Almost all Rarámuri migrate in some form or another in the course of the year. The Rarámuri religion is a mélange of indigenous customs and Roman Catholic Christianity, characterized by a belief that the afterlife is a mirror image of the mortal world, and that good deeds should be performed not for spiritual reward, but for the improvement of life on earth. In certain traditions (perhaps those more strongly based on pre-Columbian practice), the soul ascends a series of heavens, is reincarnated after each death, and after three lives becomes a moth on earth, which represents the final existence of the soul. When the moth dies, the soul dies completely. However, this end is not regarded as negative or a punishment, but merely as a continuation of the order of life. In Rarámuri cosmology, God has a wife who dwells with him in heaven, along with their sons, the so-called sukristo (from Spanish 'Jesucristo') and their daughters, the santi. These beings have a direct link with the physical world through Catholic iconography, respectively crucifixes and saint's medallions. The Devil's world is not necessarily evil, but is tainted through its ties with the Chabochi, or non-Rarámuri. The Devil is said to sometimes collaborate with God to arrange fitting punishments, and can be appeased through sacrifices. In some cases, the Devil can even be persuaded to act as a benevolent entity. The Devil and God are brothers (the Devil is the elder) who jointly created the human race. God, using pure clay, created the Rarámuri, whereas the Devil, mixing white ash with his clay, created the Chabochi. Thus, the Devil is as much protector and life-giver to the Chabochis as God is to the Rarámuri. The Rarámuri share with other Uto-Aztecan tribes a veneration for peyote. The Rarámuri are also known for the brewing of tesguino, a corn-based beer brewed in ceramic jars, that features prominently in many Rarámuri religious rituals. The word for themselves, Rarámuri, means "runners on foot" or "those who run fast" in their native tongue according to some early ethnographers like Norwegian Carl Lumholtz, though this interpretation has not been fully agreed upon. With widely dispersed settlements, these people developed a tradition of long-distance running up to 120 miles (190 km) in one session, over a period of two days through their homeland of rough canyon country, for intervillage communication and transportation as well as to hunt. Before these long distance runs, they consume large quantities of corn beer (tesguino) which is very high in carbohydrate and very low on alcohol. The Tarahumara also use the toe strike method of running which is natural for bare-footed runners. The long-distance running tradition also has ceremonial and competitive aspects. Often, male runners kick wooden balls as they run in "foot throwing" competitions, and females use a stick and hoop. The foot throwing races are relays where the balls are kicked by the runners and relayed to the next runner while teammates run ahead to the next relay point. These races can last anywhere from a few hours for a short race to a couple of days without a break.